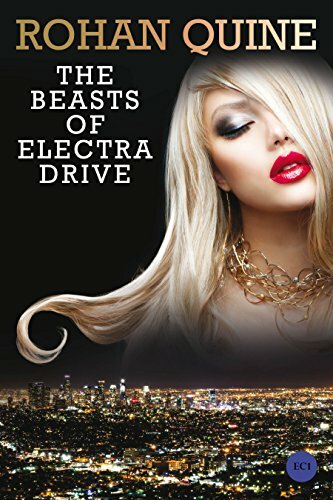 The Beasts of Electra Drive is a technologically intelligent, socially clever, and supernaturally chilling - a trippy sci-fi tale from Rohan Quine. To start, let me talk a bit about that first part, the technology. This is a book that is heavily invested in the creation of technology, the programming of games and apps, and the design of the characters who populate them. There is a strong artistic element woven into this act of creation, allowing us to see how and why Jaymi creates each of his Beasts, giving them purpose and personality as well as form. Hacking is a big part of the story, both in terms of infiltrating code and in cyberspace interactions between Jaymi's beasts and his adversaries' avatars. That technological element leads, naturally, to the social one. Ain'tTheyFreaky! is the application that promises to put Bang Dead Games on the map, and the one that drives Jaymi to abandon ship and start the creation of his Beasts. It is a despicable piece of programming that, all-too-sadly, would probably do very well in today's world. It takes the worst aspects of social media - bullying, shaming, slandering, etc. - and makes them the whole point. The more you bring others down, the higher you rise, and the more shocking your social attacks, the more points you earn. The worst part of the game is that it is not aimed at other players, or even at celebrities - exposing neighbors, friends, family, and random strangers will bring you the most points. As for the supernatural aspect, this is a book that would have been entirely serviceable with just the hacking and virtual reality interfaces, but what makes it really compelling is the ability for Jaymi's Beasts to step out into meat-space (I love that term) and take on corporeal form. These characters grow, learn, and even challenge their programming - they are somewhat childish in their willful independence, to the point of being sociopaths, although they demonstrate real emotion. There is some wonderful genderfluidity to some of the Beasts, with Shigem never feeling "quite like a boy, being half a gender to the left" and Scorpio whose "nature flowers with so transgender a beauty," as well as a gay love affair between two Beasts who were created for one another. Lest you forget that this is a revenge fantasy, however, Amber is modeled after Rutger Hauer's character in The Hitcher, while Scorpio's defining moment is the fantasy of dominating an entire prison as the most dangerous boy in a skirt. In terms of the overall narrative, I found The Beasts of Electra Drive a little repetitive in parts, but I strongly suspect those patterns and passages were deliberate on Quine's part, coding the story as much as writing it. What really impressed me, however, is the flair for language, with some really beautiful - and beautifully chilling - passages that had me dog-earing pages along the way. Personally, I found the social commentary and the digital sparring with colleagues far more interesting than the real-world gore that drives the climax, but I love the uncertainty or unreliability of Jaymi as a narrator, and the open-ended question as to whether the end justifies the means. Rohan Quine grew up in South London, spent a couple of years in L.A. and then a decade in New York, where he ran around excitably, saying a few well-chosen words in various feature films and TV shows. He’s now living back in East London, as an Imagination Thief. His tales aim to push imagination and language towards their extremes, so as to celebrate the beauty, darkness and mirth of this predicament called life, where we seem to have been dropped without sufficient consultation ahead of time. Thanks again for the read, hon. It was one I lingered over, thinking a lot between chapters (which is precisely what good sci-fi should make you do). My Smutpunk Takeover is LIVE!